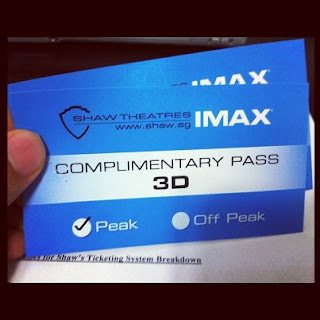 I caught my first IMAX 3D movie in Singapore, watching The Amazing Spider-Man. And it looks like Spider-Man is not the only amazing thing. I had heard many times about how amazing IMAX can be, and how you will be immersed into the movie itself, and be part of the movie. Even before the movie starts, I was totally thrilled. I watched the thriller for The Avengers and The Hobbit, and goes wow wow wow.. Conclusion is, the wholly experience is worth $22. But that’s not all to my story.. Shaw, unfortunately, had a major ticketing system breakdown for 5 days (very bad downtime). They could not let me collect my ticket (from online booking), though they simply verify the email confirmation at the entrance. we regret that we were unable to meet the service standards that we set.